LCN Wilde-Pedique is an elastic 1-phase synthetic resin with ati mycotical effect, which perfectly adjusts to the movements of the foot. Its good adhesive properties guarantee good results even on very thick nails. Wilde-Pedique allows for a gentle and durable way to seal the nail surface, smooth out ridges and deformations, cover discolouration and lengthen toenails. Wilde-Pedique, however, also has a medical indication: it is used for the treatment of mycotic infections, ligneous nails, nails infected with psoriasis, and ingrown nails. Many people suffer from diseases and changes of the toenails. Many of these changes are visible and appear unattractive. 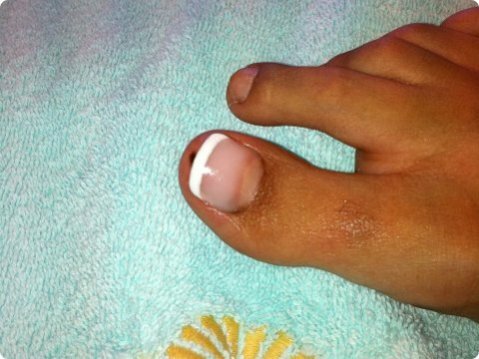 The nail of the big toe, especially, is often deformed or discoloured, it becomes partly or completely loose. Here also our Wilde-Pedique is the appropriate product or treatment for such toenails. Living on a tropical island as Mauritius, especially during the summer months, having attractive and well-groomed feet are considered very important. Deformed or discoloured toenails spoil the fun of walking either with open shoes, heels, or even barefoot. Here, Wilde-Pedique offers several, different colours from the clear to the opak to adapt to the right type of toenail. Have the perfect toenails wherever you are... with LCN Wilde-Pedique!